Did you know your recovery models could be strengthened to operate at peak performance? Simply by supplementing your in-house data with LexisNexis® Collections Attributes you can improve their effectiveness. How? Our Collection Attributes reveal far more than traditional credit data — we create them by processing, linking and analyzing billions of public records. Perceptive organizations understand by integrating these attributes into their own data they can greatly enhance the clarify of their client profiles. 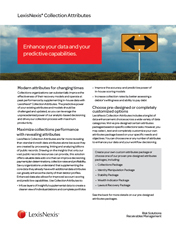 Download our brochure to learn more about improving the quality, consistency and reliability of your customer data.